Banking on our world class facilities and high-tech machinery, we as a Manufacturer, Exporter and Supplier, aim to enchant our customers by distinction. Automated Vascular Doppler Recorder for ABI / TBI (Versalab Auto) on offer is available in an assortment of specifications. The excellent material used in manufacturing is of top class quality. The manufacturing process is carried out by a team of skilled professionals who put their utmost efforts to ensure they produce the best possible quality. 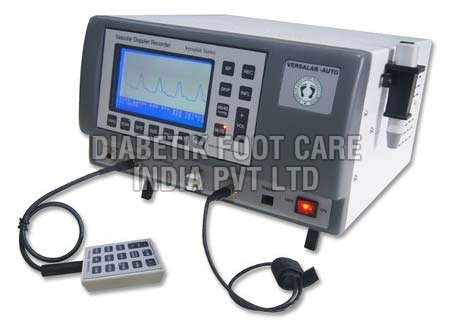 Ankle Brachial Index Measuring System Automated ABI / TBI Vascular Ultrasound Doppler Recorder model VERSALAB Auto is a PC Windows based automated ABI, TBI, PVR, Segmental BP measuring system with interpretation. This is also capable of measuring Penile Brachial Index for impotence study. Upper extremity vascular and Carotid vascular study are also possible with this model. Measurement of venous disorders is an added feature of this model. It is reckoned as the first indigenous Doppler facilitating BP measurement. It inflates BP cuffs noiselessly with silent pump and measures systolic BP of the extremities. It is provided with separate mode for a complete vascular profile study and also offers segmental cuff-sets wit manometer for ankle brachial index.